For any business that has a web presence, one of the most important activities is generating leads. Most businesses these days capture leads with email subscription forms embedded on their websites. This allows the business to build a large list of email addresses to whom they can keep in contact with for promotions, special offers, etc… and in turn, generate sales. But wouldn’t a Facebook Fan Page provide a more valuable “list building” solution than email subscription forms? When I think of a Facebook Fan Page, I immediately associate it with a “permission based marketing tool”. Meaning, people follow Facebook Fan Page voluntarily by pressing the “Become A Fan” button. And people know that once they are following a Facebook Fan Page, they are opting in to receive updates from that Facebook Fan Page. So now whatever business owns that Facebook Fan Page can send out updates, promotions, and other informative content to their growing list of fans. And better yet, the fans of your Facebook Fan Page can actually comment and interact with your comments and updates. Doesn’t this make a Facebook Fan Page more valuable than an email subscription form? Let me know your thoughts in the comments below. Another advantage I see that Facebook Fan Page has over an email subscription form is that Facebook can deliver viral marketing to your business that email forms cannot. As a fan of your Facebook Page, if I comment on that page then all of my friends can see that comment. That comment is directly linked to your Facebook Fan Page which opens up exposure and traffic to a wide audience of people on Facebook that never would have heard of your business otherwise. And I would also argue that it’s easier to get people to become a fan of your Facebook Fan Page than it is to get them to join an email subscription list. A Facebook Fan Page promo box can easily be integrated into any website, and all someone has to do is push the “Become A Fan” button – no forms to fill out, no links to click in their email address to confirm their email subscription. A Facebook Fan Page makes it super easy to build a “list of subscribers”. So I guess what I’m saying is that the term “list of subscribers” is analogous to “fans of a Facebook Fan Page”. And in my opinion, Facebook Fan Pages provide a more perspective value for list building than email subscription forms. I now defer to you – what do you think? 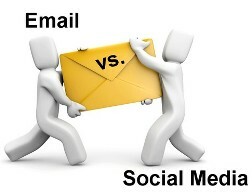 Would you agree that a Facebook Fan Page is more valuable than an email subscription form and email marketing service? Ok so fan pages are good, and easier than an email subscription option, but I am stuck as to work out how to actually get an email sent to those fans. You can "Send an update to fans" but this does not seem to generate an email. Instead of you having to send out emails via your email list building platform (i.e. Aweber, Constant Contact, etc…) you would send your message via the wall updates of your Facebook Fan Page. As you send your updates from your Facebook Fan Page wall, all of your "fans" would instantly get that update in their news stream on Facebook. Statistics show that people are now spending more time on Facebook than they are reading emails, and they are also communicating more ofter, and more effectively, with other people through Facebook. So by sending Facebook Fan Page updates through Facebook you are actually reaching your interested prospects in a higher quality fashion. And finally, when any of your fans comment back on one of your fan page updates, their comment and your Facebook Fan Page is spread virally to all of their fans. IMers like Crowd Conversion and Facebook Marketing Academy are recommending having Aweber signup forms on custom FB tabs. I finding that idea hard to follow – someone becomes a fan of my page AND signs up for my email list? Does a list of fans replace an email list, or is it a separate list in itself? Do I send the same messages to fans and email subscribers?